U.S. Motherhood Maternity has awesome offer available now! Get 50% discount on one regular priced item when you use printable coupon. You can get this printable coupon through U.S. Motherhood Maternity emailing. Offer is valid until January 16, 2017. Source of the information is Motherhood Maternity. For more information visit any U.S. 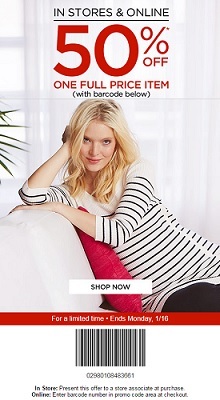 Motherhood Maternity store location or U.S. Motherhood Maternity online.